Instagrammers and their beautiful travel photos can often be deceptive — and you may not realize until after you’ve bought your plane tickets and made your travel plans. 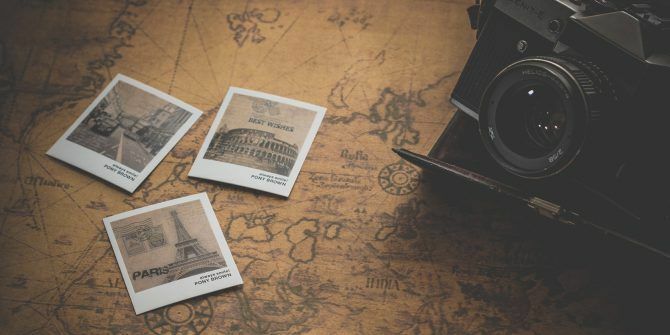 That doesn’t mean you should stop using the visual pull of Instagram photos for your travel inspiration 12 Instagram Accounts to See Amazing Places Around the World 12 Instagram Accounts to See Amazing Places Around the World Instagram can take you to places around the world faster than any vehicle, and for free! You just need to pick the right accounts to follow. Here are 12 Instagram accounts, perfect for travel inspiration. Read More . There are many genuine travel Instagrammers around to stoke your curiosity, those who don’t use Photoshop’s trickery. Instagram has given us a new way to discover new places to travel to. There is also a new way to make this location search and travel planning better. Let’s bring out the little travel guide for your pocket. Sherpa is an iOS app that’s out to prove that you can make your travel plans with Instagram alone. Like its namesake, it wants to be your travel guide around the world. The iOS application curates photos of global spots, events, food, and other cultural totems from top Instagram photographers and presents them as beautiful visual travel guides. These are further supported with data from other services, like Foursquare and Wikipedia. Enter your email and connect with Instagram. Specify your home base on the next screen (i.e. your home city). You can also let the app to organize your own public photos by location. Search for a location or browse through Sherpa’s travel guides. Scroll through the collection of trending locations. As you browse the travel guides, you can save to your “Suitcase” photos of places you want to go. The Wikipedia entry for each location gives you a sense of the place. You can also get an idea of other hotspots like restaurants and landmarks on the Google map which pulls in data from Foursquare. The app doesn’t provide features to book hotels or flights right now. That can be a future feature or an overkill for something that is minimal and pretty to look at right now. But the founders do hint at that idea. Eventually, every photo you see on Sherpa will be bookable, and you’ll be able to search for trending hotels or book the amazing off-the-beaten-path trip that a travel photographer you follow has gone on. Sherpa can be a good support tool for discovering the less beaten paths. Just one photograph can pique your interest enough to find it with other travel tools or with your feet. As a photographer, an app is also an offbeat tool to learn from some nicely framed shots. How useful is Sherpa for your next travel plan? Do you turn to Instagram when you are planning a trip? Explore more about: Instagram, Photography, Travel. 9 Thriving Twitter Communities All Geeks Should JoinTop 10 Most Popular Accounts on Twitter: Should You Follow Them Too?